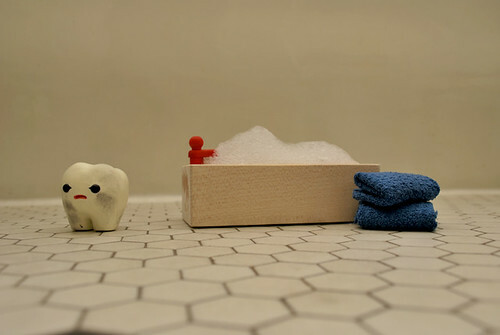 Time for a bath, my little Milk Teef! "Lardee why are you hiding?" "No, I don't think you're allergic to water, Lardee." "Here, take my rubber duckie. It will make you brave." "We be bubble monsters! Rawrrr!" Okay guys, try to stay clean from now on. I love these SO much! It really touches all my emotions. Thank you Inhae. This makes me giggle - it's like a ticklish photo haiku - Keep them coming! These are too cute. I love the one with Lardeeeeeeeee! Anyway, I'm sending a kiss now to the toof! I wonder how the toof will react to a human kiss...any images???! so so so cute! 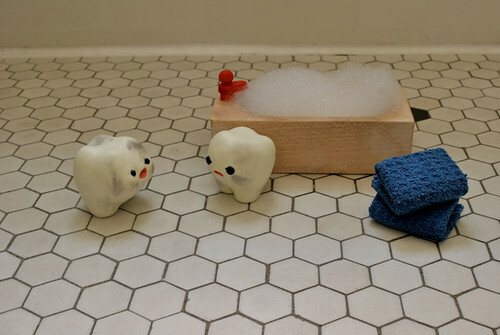 that little bath tub and the little towels and the little rubber duck, not to mention the toofs (teef?) 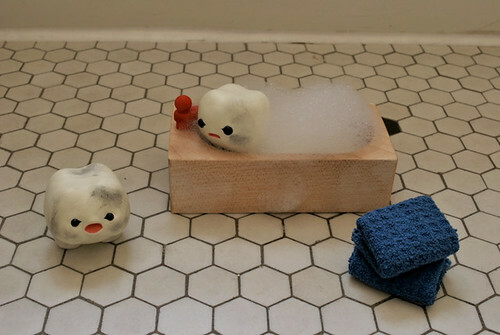 and the suds AHHH! OVERLOAD OF CUTENESS! WOW! this is SO cute! Beautiful R! 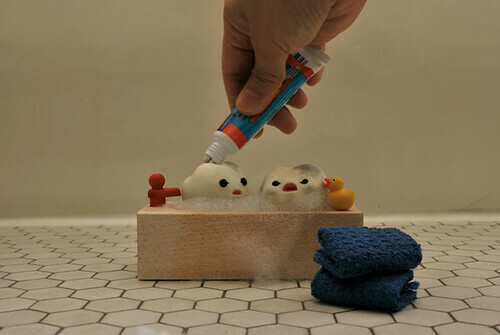 Your stoties are very cute! This blog brings such joy and smiles to me! This might be the best site on the internet. LOVE! omg this had me laughing so hard. this is my first visit (you made it on CuteOverload! congrats!) what a great idea. thank you! This is one of the most beautiful things I've ever seen! Your blog is awsome, Inhae! 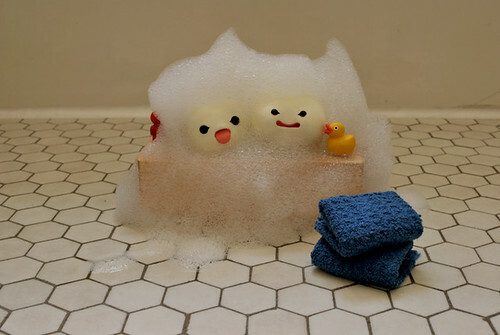 Bubble monsters, how adorable. i'm in love. At first I was thinking - what the??? But after a read, I'm in love- lol crazy, cute, fantastic, and really well done! 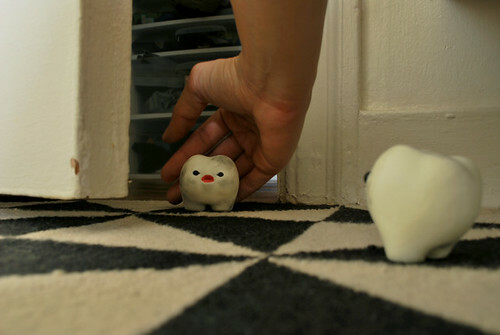 OMG widdle teefs :D <3 the blog! Awesome art :). Honestly the last one I could not stop staring at. 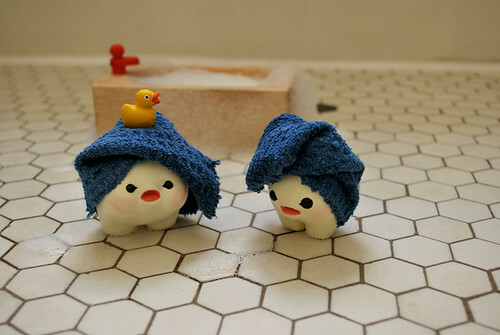 I love the towel-heads. Adorable. Keep it up! Oh my, how completely perfect. My teeth ache from how sweet this is. You have made my day wonderful, so thank you. i could see these easily getting a book deal. have you searched one out? wow! i just discovered your blog today - i'm so thrilled! can't wait to share with peeps. Heheh, you just made my day-super cute! Wow, this so creative and fun to watch. love it! Wahaha!! This is so adorable!!!! Very awesome and so creative. The photos are setup just perfect and really does make you believe that the lil teef are alive. Very well done. It's almost too cute to handle! I was totally smiling like an idiot whilst reading these cute cute cute stories!! !I'll make sure I'll spread the word! 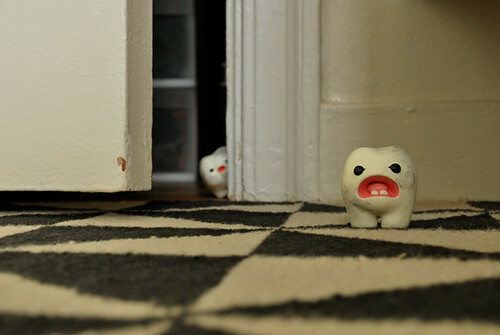 I just found out about Milk Teef from cuteoverload and I love them! Thanks! Love this...subscribing now so I can see all their latest adventures! Terrific work! Oh my God, that's the cutest thing I've ever seen! Love it. This may be the most adorable thing I've ever seen - my goodness but what a clever idea. I love the gorgeous, charming simplicity of these. Keep them coming! I am DED from cute. My new favorite blog. TOO cute!! Awwww. Found your site through CO, absolutely wonderful! Keep it up. This is so well done, and so adorable! im emotionally hooked to ur blog. I love your blog your photography is great and the story is allot of fun. Wow, so cute! Thank you, I needed a smile todday! A friend tweeted about this is how I found you! The rosy cheeks on the teef in the last photo just did me in. Is it possible to die of cuteness and sweetness? Because I think I am going to die! My heart is melting! Oh what an absolute dream. I want a sweet little dog named Lardee now. In addition to seeing it as a book, I'd love to see this as stop motion animation or claymation, with little kids' voices for the teef and cute little music, like musicbox music almost. And maybe a fuzzy glow effect around the edges. GOD THIS IS SO SWEET I CAN'T STAND IT! Discovered you through Cute Overload. Loving your work. OH god the "Lar-dee!" panel is so wonderfully alive I can just hear his little toofy voice in my head! LOL! I'm gonna have to show this to my 3 yr. old that doesn't like to brush her teeth! *Giggling* I stumbled upon the Milk Toof through a Twitter Tweet. I love it! This just made my Monday! Good luck with it and your blog. This is great. Please make more. They are so cute. Really like your blog. so cute and so pure. lovely. xoxo from brazil. This is so beautiful and sweet and funny! Congratulations from Brazil! i don't know how you are doin' this, this is my first visit and am almost in tears..i just don't know why..
you need to do a book -- these are SO sweet and appealing. people will eat it up! keep up the awesomeness! 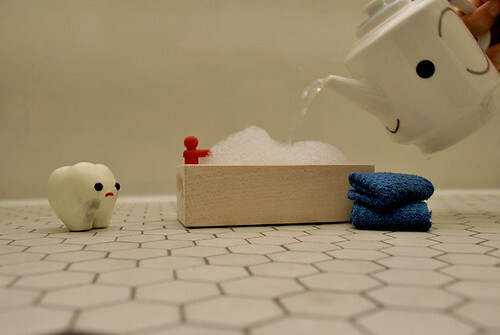 This blog is adorable - love the imaginative poses. Great work! Please never stop bringing us these wonderful stories. when my son can understand the pictures, I see it all that are here. So adorable! 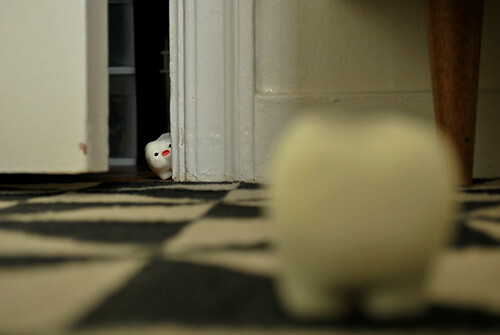 This is the cutest blog I´v e ever seen. Love little ickle and lardee!!! I am in love! You are brilliant! I'll just echo some of the other comments + a few of my own, k? You should think about a book, a short film, making some clay teef and maybe even fabric teef, teef theme accessories, etc. I would seriously use a tote with ickle on it. This blog is awesome, there are SO many possibilities! You are one talented gal! LOVE IT!!! i absolutely love this website. keep it up. original, quirky, and very funny. i love teeth. i love them so much. i think they're the coolest things in the world. this just made me love them even more. Your Milk Teef are soo cute! Super adorable. Totally made my day. 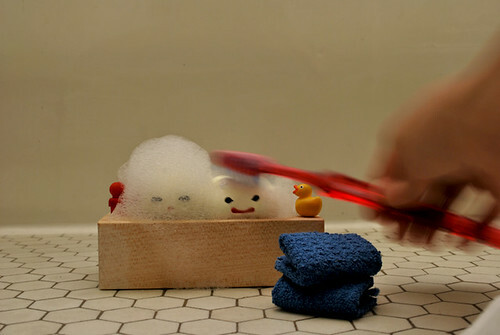 i wanna have one of lardee & ickle..
Aww, that is sooo cute! hee. these are cute. I want a lardee and ickle too! These are just about the cutest things I've ever seen. 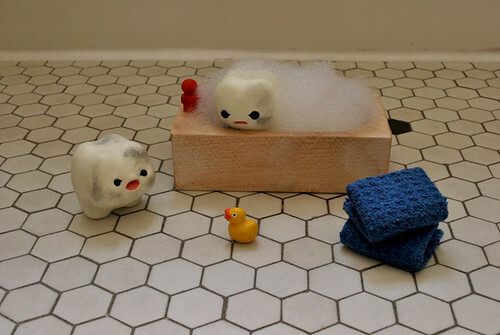 I might come tap tap tapin on your door too, just to take a bubblebath with a rubberduckie and a milk toof. They're so cute it's hurting my eyes, I love them. If you ever need a vacation, Lardee and Ickle can stay with me - promise! I can be the milk toof auntie. Ps! You really should consider a bookseries for children. As a possible milk toof auntie I promise to buy them. all of them. can't wait for their next adventure!! wow, your blog is totally unique and outstanding. keep going!! love it. ehehe. it's so cute I could just vomit! This is the sweetest blog I've ever seen! The whole idea is awesome! It is sooo cool! I don't get how you are able to do this little theatre with the small figures so often cause it takes time, I think! ;) It is freaking wondeful! I follow your blog with bloglovin' and I hope you want to follow mine! Awesome work! Reading through the comments here, it is amazing how your creation has touched so many people. Keep spreading joy! Such an amazing story teller! Keep em coming!!! 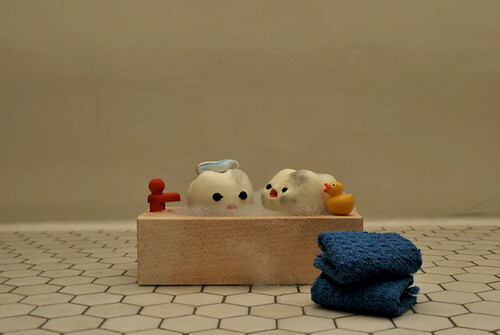 Bath time photos are TOO CUTE! Awww so cute!! I really love them, I have to follow this blog! i love ickle and lardee. they just made my rainy day about a million times better. thank you. Just adorable...I love the pink "just took a bath" glow! 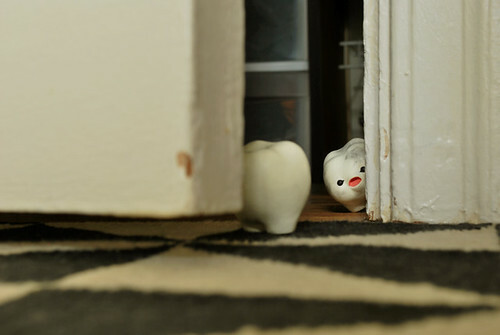 This whole toof story is just so amazing and heartbreakingly adorable! Great work, keep it up! Absolutely love your blog! 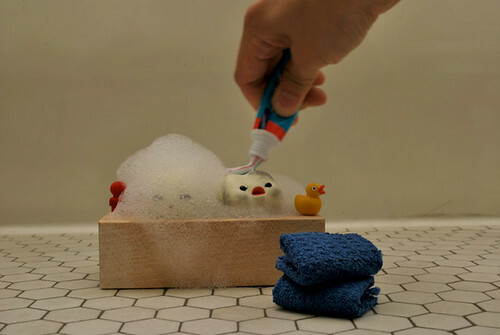 Its so creative and unbearably cute! I really hope that one day you publish these as children stories. I linked one of your pictures to my blog because I wanted to write about how happy your blog made me. Hope you do not mind! Oh my god , they are so cute ! I'm in love, really ! Thank you for sharing this with the rest of the world - the teefies are adorable, especially with their freshly scrubbed, pink-cheeked sweetness. Humor doesn't always have to be mean spirited, and you've been proving it week after week. +5 for the Muppet Movie reference in the 6/10 blog! love you ickle and lardee. you make me miss my own milk teef. 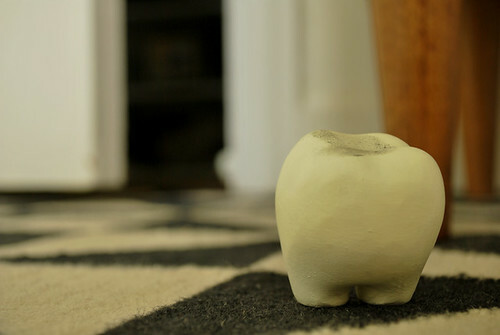 I just found 'My Milk Toof' and I LOVE it! I shared it with everyone I know. Thanks for this fabulous creation! Keep em' comin'. This is making my day. Thank you, Inhae! Sooooo adorable and cute and lovely!! Warms the cockles of my heart!! i love ickle and lardee! they are so cute! :D this is just the cutest thing ever. ;_; now i wish i had a baby toof. At the risk of sounding just like everybody else, This is such a cute blog and I found my self oohing and aahing out loud and I didn't care! did you make those tiny stuffs? awww this one is the best! LOL awwww ♥ my favorite one yet! ...and that teapot is amazing. can you tell me what brand it it / where it is from? These two milk teeth are very cute. I want a Milk Toof!!! I love this one. I can already see toy lines, for kids and picture books. Keep up this genius original work. Oh! I used one of your pictures because I wanted to plug your blog on Tumblr. Is it okay? :) I put your name there. These are SOOO precious! My little 5 year old son and 2 year old daughter have taken on the characters and make me read this story to them daily, I love hearing their little giggles, it's so much fun! These guys are the cutest ever! Aiyee! I LOVE Ickle. I think I might want a toof instead of a dog, eh? Very cute and creative. I loved it. My kids were going crazy when I showed them. They were having such a good time. These are amazing. I'm completely additcted to them. Thank you so much for creating such adorable characters. thiiiiiiiiiiiiis issssssss sooooooooooooooooooo lovelyyyyyyyyyyyyyyyyyyyyyy! I want lardee and ickle as toys! mattel, look at this!!! Hope your published works & products will get to Malaysia one day.. 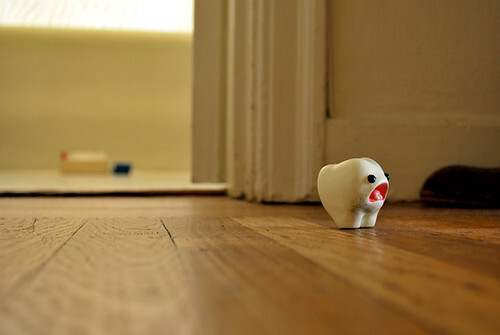 Imagine selling Milk Toof Soft toys! You're so creative..love your work! I think a part of me died inside due to these teef. They are so massively cute, the child in me is currently melting and I want to show this awesomeness to my friends at a Charleston, SC dentistry office. The young patients and children there will love your work and they will be entertained while having their operation by the dentist (Charleston, SC). I think you are going to see a lot more of this stuff in the future. Oh it makes my heart tickle...they are so cute. I don't know the last tie I've seen anything this cute. Just PURE GENIUS. Explanatory and very easy to follow because of all the images you took. Good job I really appreciate your effort. lardee and ickle are so cute.. We really love them so much and we always follow their adventures! My 4 yr daughter loves these toofs so much that I am asked about ickle and Lardee everyday, and she keeps telling their stories to one and all.